Quarrels over its exact origins aside, I like to think that my Spiced Plum Streusel Cake is a touch healthier than its original. It is low dairy, low sugar if you wish and yeast-free, because, frankly, who has the patience? Made with wholemeal spelt flour, it’s my current good-for-you cake favourite, too! Have you seen them? Curvy and of dark burgundy and rich violet skin. The abundance with which plums are gracing the shelves of grocers’ from early March (or August as it happens in the Northern hemisphere) is mesmerizing. It’s a sure sign that Autumn is here and it’s Autumn that holds some of the most cherished food memories of mine. There were weekend escapades to the woods for wild mushroom picking. And my persistent pleas to help Mum with preserving bountiful fruit and vegetable harvests into relishes, pickles, compotes, sauces and jams for winter. Now, since moving to the flip-side, I also get to celebrate my birthday in Fall. Hello there 32! 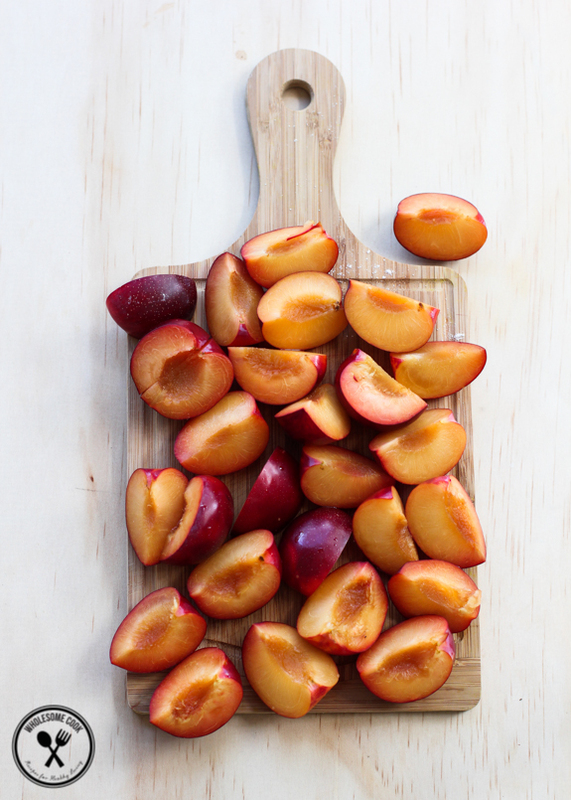 For me, plums signify a change in season and I find them tremendously good at morphing into delicious things. They can be stuffed into potato dumplings, taste lip-puckeringly good pickled (yes!) and make a deliciously sweet yet tart compote. To make homemade plum and prune jam, you require nothing more than those two ingredients – as they contain enough water and sugar to turn into a sticky jam with a couple of hours of gentle cooking. They also bake well. Almost magically, they hold their shape well when buried in between the spongy and crumbly layers of pastry. 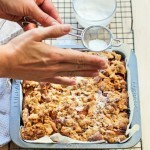 When baked their flesh become lusciously tart balancing out the traditional sweetness of the the Streusel cake itself. Quarrels over exact origins aside, I like to think that my version is a little healthier. The base is yeast-free, mainly because yeast requires time and fiddly conditions. Too hard basket, right? Instead, this quick version relies on eggs to lift the base. Since spelt flour is our go-to flour at the moment and much easier to digest in general, I’ve incorporated wholemeal spelt flour into both the base and the crumble. Plus there is the option of using natvia as a sweetener. And, if you take into account that I used coconut oil for the base and butter only for the crumb, it’s pretty low in dairy, too. This particular Spiced Plum Streusel Cake was my Polish contribution to an International Food Festival hosted by a local church. The cake, literally thrown together at last minute (not something you could do with a yeast dough), proved to be a popular treat disappearing quickly, such is the appeal of the crumble and spice. If only I had been able to find my lamington tin, the base would have been slightly lower and the plum filling more prominent. Perhaps I will add that tin to my birthday wish list for next year. 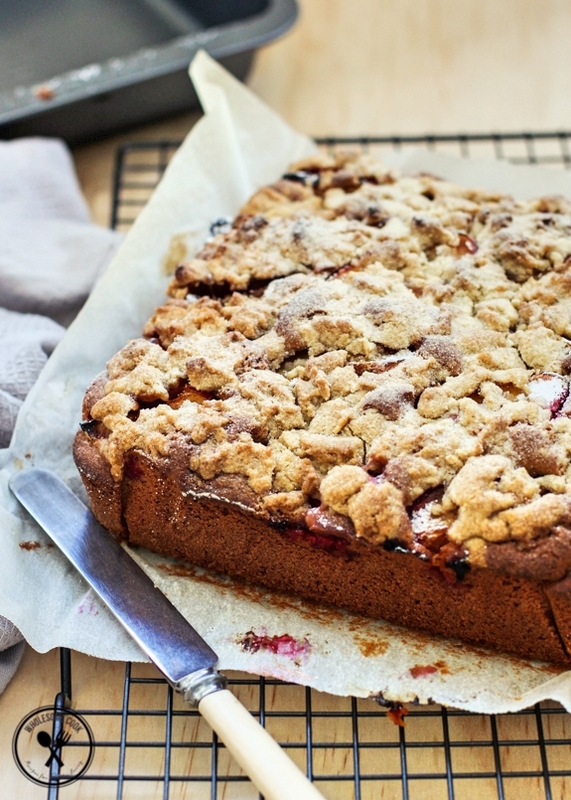 When life gives you plums, make Spiced Plum Streusel Cake. This quick Streusel Cake is yeast-free which means it can be made in under an hour. Low dairy, sugar and uses the gentler on the gut spelt flour. 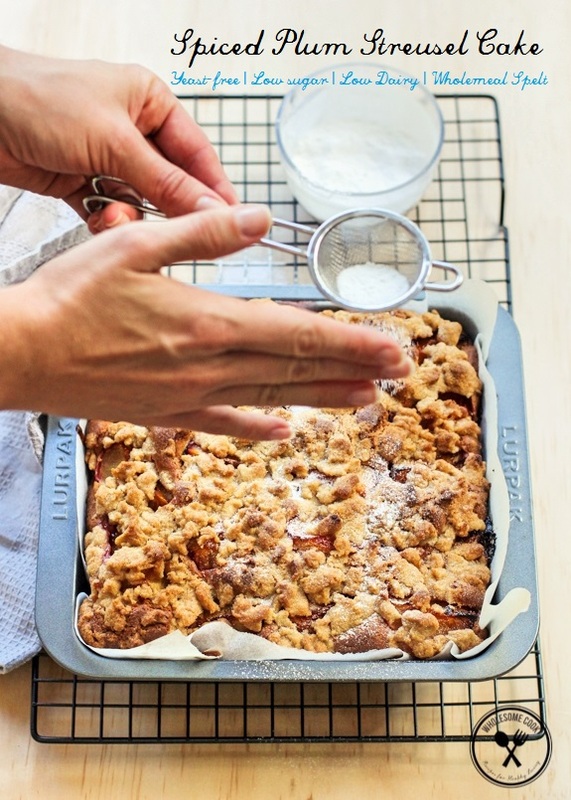 You will need a 30cm x 20cm rectangular baking tin for best results. Cake can also be baked in a square or round 20cm tin, but the base will be higher. Place flour, sugar or natvia and butter in a bowl. Rub together with your fingers until rough crumbs form. If the dough comes together into a ball, that's ok too - you can pinch bits off and crumble over the cake later. Place in the fridge while you prepare the base. Wash plums, pat dry and cut into quarters, removing the stone. Set aside. Using an electric mixer on high, beat eggs, natvia or sugar, vanilla essence and sea salt until pale and fluffy, and roughly doubled in size. Reduce speed to medium, add spices and pour in melted coconut oil in a slow and steady stream. Reduce speed to low and add flour and baking powder, mix only until it is incorporated. Line a 20cm x 30cm tray with baking paper. Pour base batter into the tin and dot snugly with plum quarters, skin-side down. Sprinkle over with the crumb mixture and bake on the middle rack of the oven for 45-50 minutes. Once ready, remove from the oven and cool on a wire rack before dusting with powdered natvia or icing sugar and serving. Oh my! This cake sounds and looks fantastic.I will be printing the recipe. And Happy Birthday Marty – it’s a fabulous time of the year to be celebrating, isn’t it? I made a streusel/crumb cake just a few days ago. 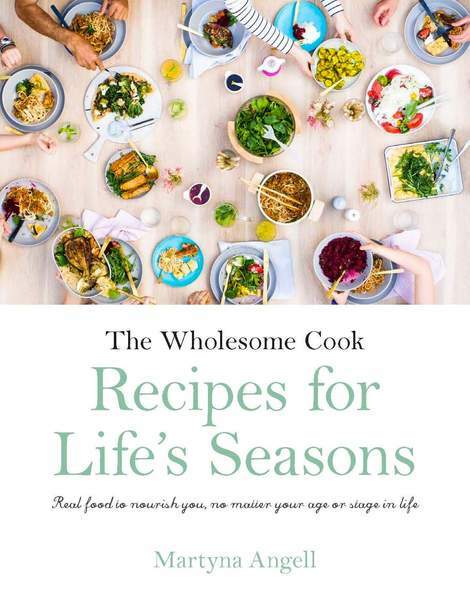 But yours seem so much healthier with spelt flour, natvia and coconut oil. Plum is such a nice juicy pairing with the crumble. Oooh! This cake looks amazing! I will definitely try it withplums. Happy Belated B-day Martyna… I have not worked with spelt flour very much so your recipe sounds very interesting. 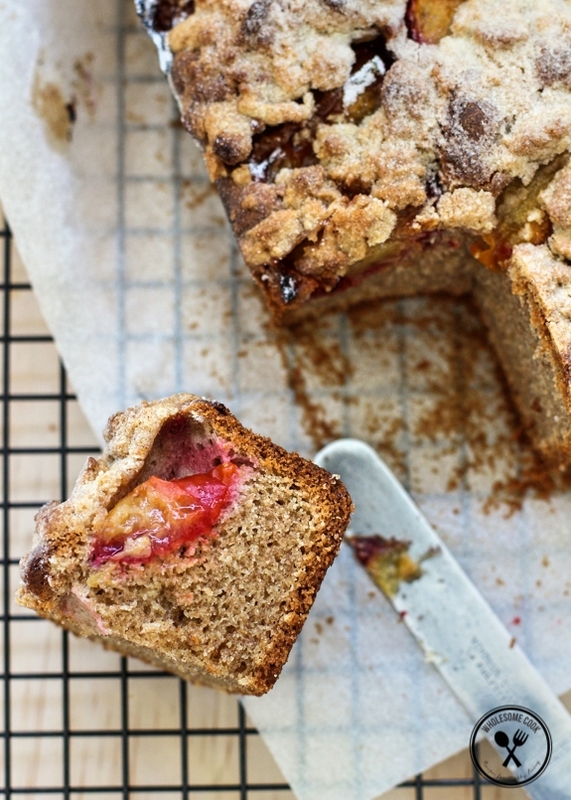 Love those beautiful stone fruits in this healthy streusel. Oh yum, this looks so delicious. I can’t wait to give it a go, I love spelt.